In the spring of 1900, America’s foremost composer and conductor John Philip Sousa brought his large band to Europe. Sousa always dreamed of playing his patriotic marches overseas, but until the turn of the century no good opportunity presented itself. When the lavish Paris Exposition opened in 1889, Sousa was asked to attend. The following year on April 22, a farewell concert took place at the New York Metropolitan Opera House. The next day, Sousa and his band, all sixty-three strong, set sail for France. Sousa was already a celebrity, not just for his music but for his direction as well. Born in 1854 in Washington D.C., of modest means, Sousa was the third of what would be ten siblings in all, although several died in infancy. Sousa’s father was a military man who played trombone in various bands. “I really believe he was the worst musician I knew,” Sousa playfully recalled, “and I’ve known many” The elder Sousa taught trombone and soon a young John shared his father’s love and natural talent for music. By the age of thirteen, John was performing, mostly wind and string instruments. He knew some piano, but refused to master the keyboard because he thought it might “interfere with his composing.” At 21, Sousa was conducting and composing. He wrote several operettas, but worked well with other more successful collaborators, like Gilbert and Sullivan, who praised him for his orchestration in a production of H.M.S Pinafore. In 1880, a telegram changed Sousa’s life and career ambitions. It was an invitation to lead the U.S. Marine Band. Sousa had never conducted a military band before, but took the offer as a challenge. He changed the music library which was mostly “hackneyed” works and added more instrumentation. 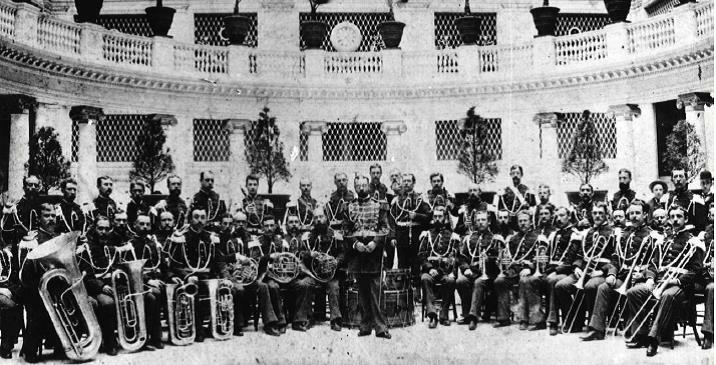 The pay was low for the musicians, but Sousa urged them to keep practicing and rewards would follow. Soon the band was playing for the President and other important dignitaries. Sousa wrote a march for the Marines titled, Semper Fidelis, and one of his other marches written for a newspaper contest, The Washington Post, became a two-step dance craze. Sousa was enjoying his newfound success, but wanted more room to expand. In 1891, after his father’s death, Sousa ended his military career and started a civilian band instead. In dramatic fashion, Sousa held his last Marine Band concert on the lawn of the White House in front of President Benjamin Harrison. And as the papers noted, quite symbolically, it rained. The Sousa Band was a big hit. It was similar in style to the Marine Band which played his marches, but Sousa could now branch out into operas and suites too. Sousa inspired by his new troupe, wrote several more pieces, including more operettas. 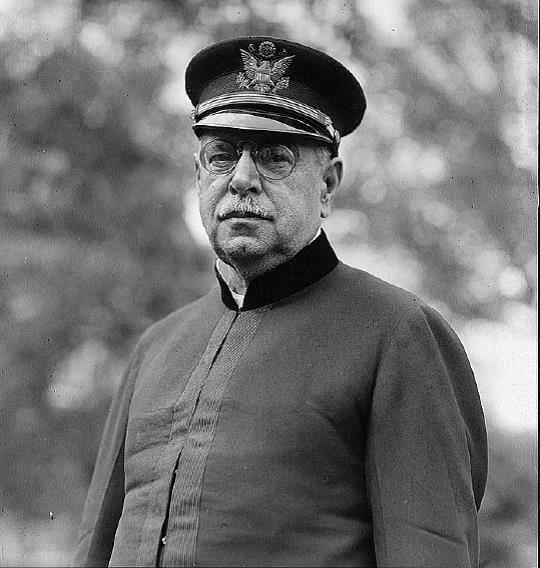 When the Spanish-American War began and patriotism was at an all-time high, Sousa volunteered to serve in the Army. In his second tour, he got sick and nearly didn’t make it out of the hospital. Sousa contributed a few marches as a member of the Army, but saw little action. After recovering, he dedicated his life to music. By this time, the Sousa Band was internationally known and a European tour was inevitable. But there needed to be a good reason. That’s when the invitation came from the Paris Exposition committee. This was unprecedented. Until then, no American band of this size had come to Europe and entertained big crowds, and certainly not one with the stature of Sousa’s ensemble. Virtuoso pianists in Europe had been coming to America since the early 1800’s, but American musicians usually avoided the grueling trip overseas and condemnation at the hands of a prickly foreign press. Sousa knew he could change that. Sousa’s band is here. breeding homesickness in the colony and fascinating Parisians. There is nothing quite so good in Paris: Indeed there is nothing quite so good anywhere. And the march king’s music has gotten into the heads and hearts of the people. German audiences were slower in praise, comparing Sousa’s band to their own accomplished military ensembles, but gradually, recognition became commonplace. Good musicianship and technical performances won over hardened critics. The band played 175 concerts in France, Germany, Belgium, Holland and England. After it was over, audiences demanded they return. The Stars and Stripes Forever quickly became Sousa’s most popular march in concert. Four years later, he would bring it to Europe. Reblogged this on Thoughts of The Brothers Karamuttsov.